Wreckage. Roberta Iannamico. Translated by Alexis Almeida. Toad Press. La Verne, California. 2017. Alexis Almeida's translations of the Argentine poet Roberta Iannamico make us believe that Iannamico has a great sense of humour. This poet doesn't take herself too seriously which is just perfect for writing serious poems. The poet who wrote Wreckage has a great sense of humour and Today's book of poetry always finds that it makes for an easy connect. Iannamico writes poems the way one might tell a story to a friend you want to amuse. These short narratives, while long on charm, don't hesitate to give you the details of every ordinary day. Except that Wreckage is never ordinary. Although never ostentatious these poems do cast off an unexpected light. At times they almost sparkle. with the sleeves of his sweatshirt. Sparkle certainly isn't the right word at all, what Today's book of poetry meant to suggest was that Iannamico radiates a certain happiness in all of her smallest details. If not exactly happiness than perhaps she is surfing the Saint Milan of K's "unbearable lightness." 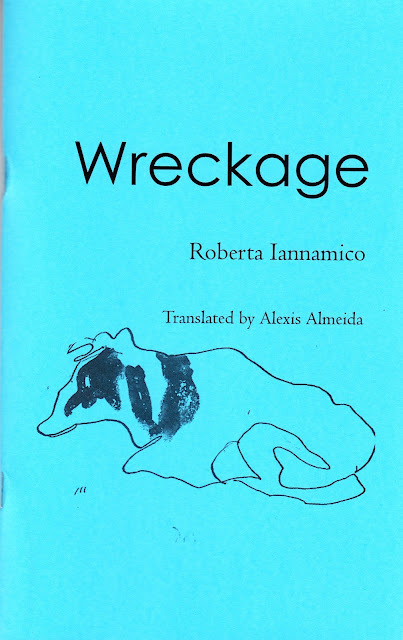 Roberta Iannamico's Wreckage is laced with poems that are tender without being fragile. Almeida's versions of Iannamico's poems would lead Today's book of poetry to believe that she has captured the intended feel of the original Spanish, but these poems never read like translations. "Vegetable Stand" is a list poem of sorts and all of you followers of Today's book of poetry knows how much we love a list poem. Today's book of poetry's morning read was brightened considerably by the presence of our visiting niece Tinselvania. Only recently returned from a trip to Berlin where she was hunting for an Art School. We feted Tinsel with the finest beans and rice in town with a visit to Margo's, a Haitian kitchen. I'm a complete sucker for the "deep fried cube pork" with a small serving of the razor hot Pikliz. Tinselvania writes excellent poetry herself but disguises it as game-code. Ms. T. made herself at home in our offices and sounded just like a regular when her turn came around. Today's book of poetry felt instantly at home in the pages of Wreckage. These poems made me laugh, wince, laugh. Reading Roberta Iannamico was a bit like walking into a new room that felt instantly familiar. Wreckage is the second chapbook from Toad Press that has graced our pages. Toad Press translations sound and feel so natural that you'd think these poems were written in English. Roberta Iannamico's Wreckage walked into the room, sat down in my reading chair, like an old friend coming to visit. She and her poems have found a new friend. Roberta Iannamico has published many books of poetry, including El zorro gris, el zorro blanco, el zorro colorado (Vox, Bahía Blanca, 1997), Mamushkas (Vox, 1999), Tendal (del Diego, Buenos Aires, 2000), El collar de fideos (Vox, 2001), Celeste perfecto (Crudo, Buenos Aires, 2005), Dantesco (Vox, 2006), Muchos poemas (Voy a salir y si me hiere un rayo, Buenos Aires, 2008), Un día nuevo(edición de autora, 2013) Nomeolvides (Vox, 2015), and Qué lindo (Zindo & Gafuri 2015). She has also published various children’s books. She is a singer-songwriter, and conducts poetry workshops as well as song composition workshops for children and adults. Alexis Almeida grew up in Chicago. Her poems and translations have appeared or are forthcoming Gulf Coast, The Brooklyn Rail, Prelude, TYPO, Dusie, and elsewhere. She is an assistant editor at Asymptote and a contributing editor at The Elephants. Her chapbook of poems, Half Shine, is recently out from Dancing Girl Press, and her translation of Florencia Castellano's Propiedades vigiladas [Monitored Properties] is recently out from Ugly Duckling Presse. She has received fellowships and residencies for Yaddo and the University of Colorado, where she completed her MFA. She recently spent the year living in Buenos Aires on a Fulbright research grant, where she has been compiling and co-translating an anthology of contemporary female poets living in Argentina.